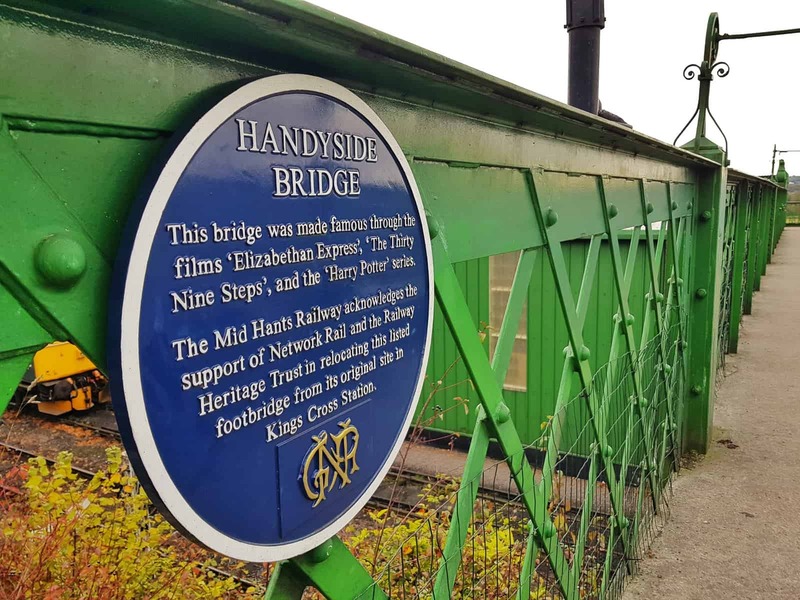 Mid Hants Railway Watercress Line in Hampshire often plays host to exciting events like the Day out with Thomas. That’s why it came as no surprise that with Halloween on the horizon, they had something special planned. The Wizard Weekend is a celebration of all things magic. And what better place for it than the home of the real Kings Cross Footbridge from the Harry Potter films? 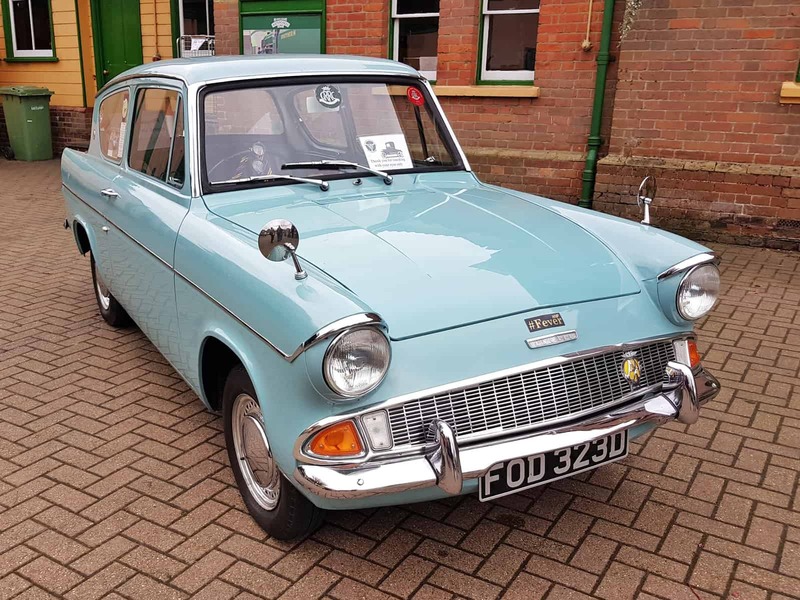 Bright and early yesterday morning, we headed for the Watercress Line’s Ropley Station where plenty of free parking was available. 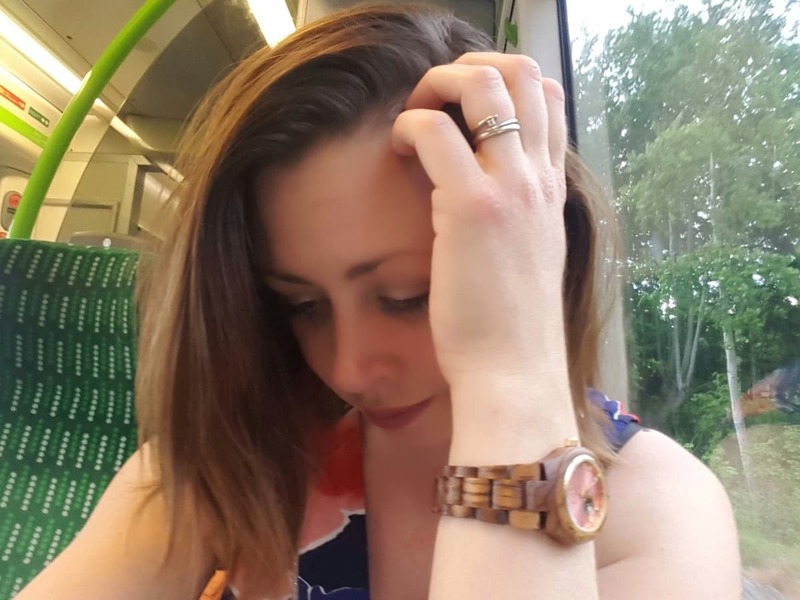 From there, we collected tickets that entitled us to unlimited travel on the Wizard Express and on the miniature railway at Alresford station. 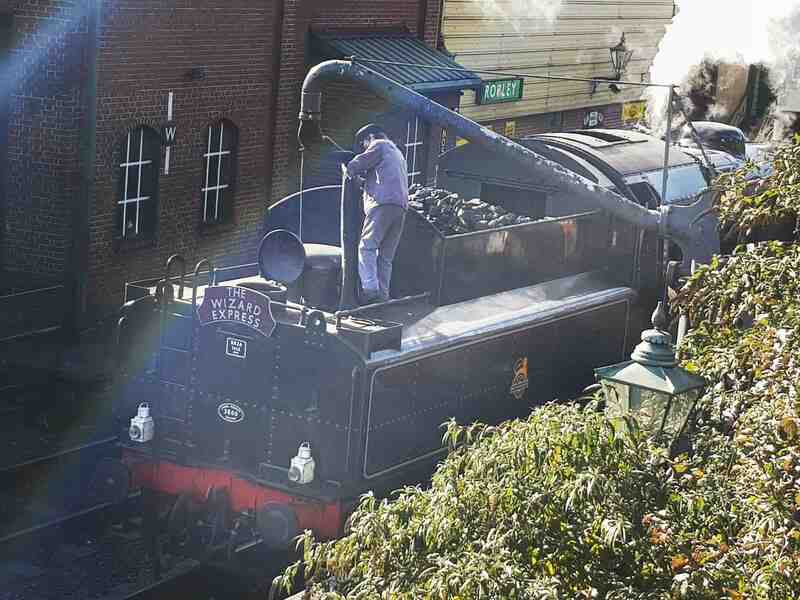 Before boarding the train, we spent some time exploring Ropley. First stop was the bird display, where you could pay £1 to hold an owl. Lia didn’t want to hold it but Libby held it and we all stroked it when it was back on the handler’s glove. This incredibly patient Great Horned Owl was happy to sit still for Libby and pose for a photo. 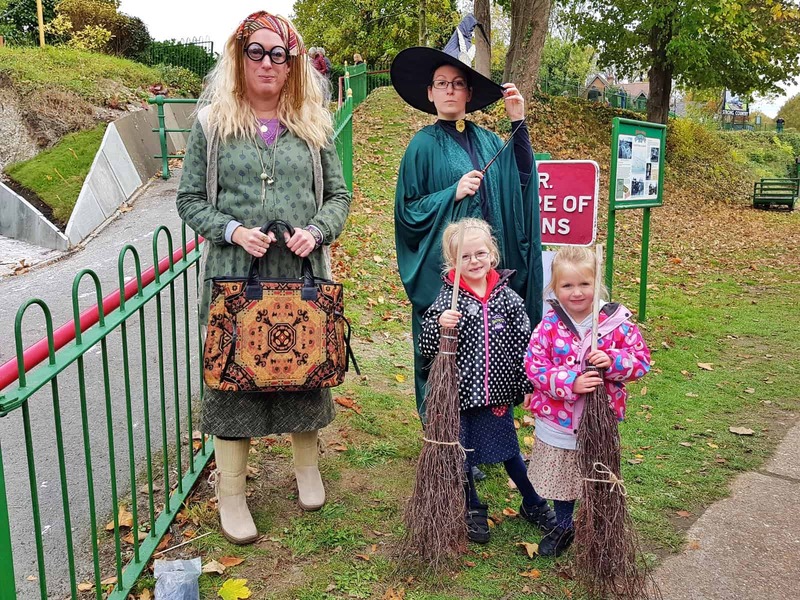 The girls stopped to play on the children’s playground and ride on the miniature railway before watching broomstick making on the platform. 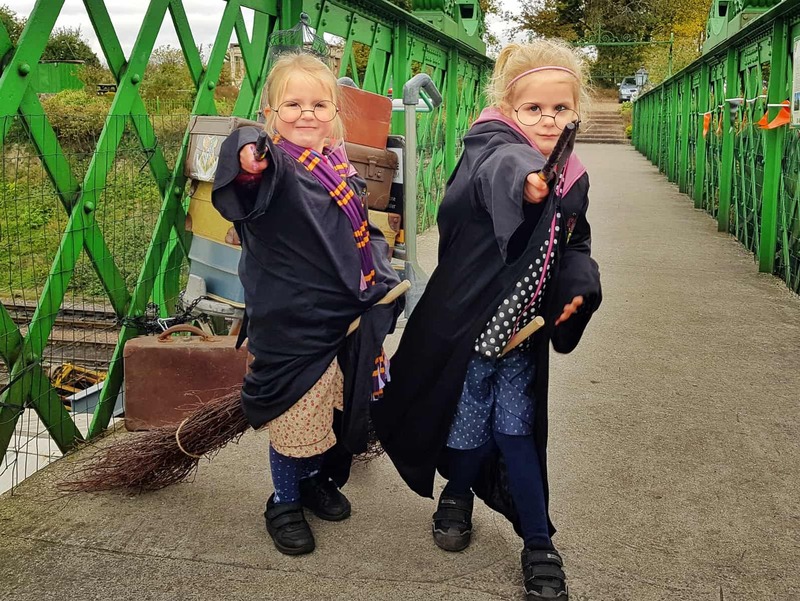 The handmade wooden mini broomsticks seemed really reasonably priced at just £4.50 each, so we caved in to the pleas and bought the girls one each. 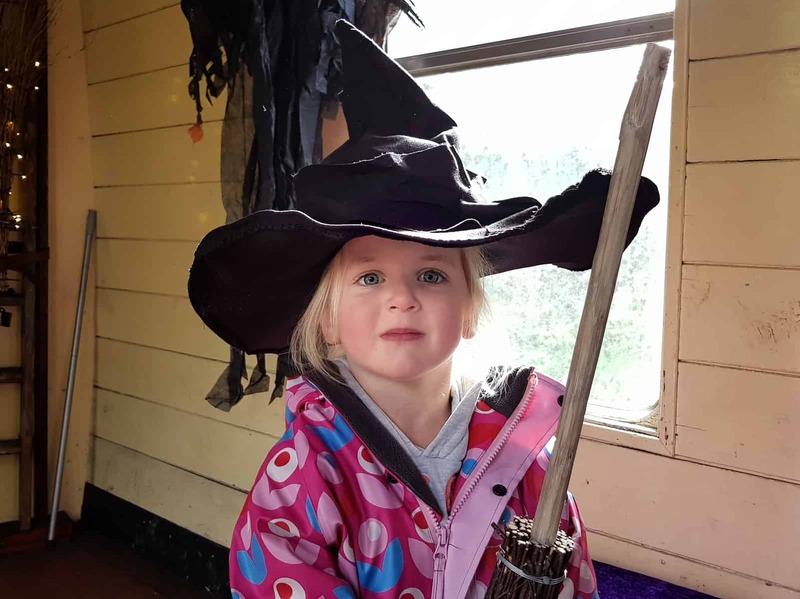 Then, broomsticks in hand, we boarded the Wizard Express steam train and headed to Alresford. One of my favourite things about the Watercress Line is that it’s so dog friendly. So, even Bubbles joined us on the ride. 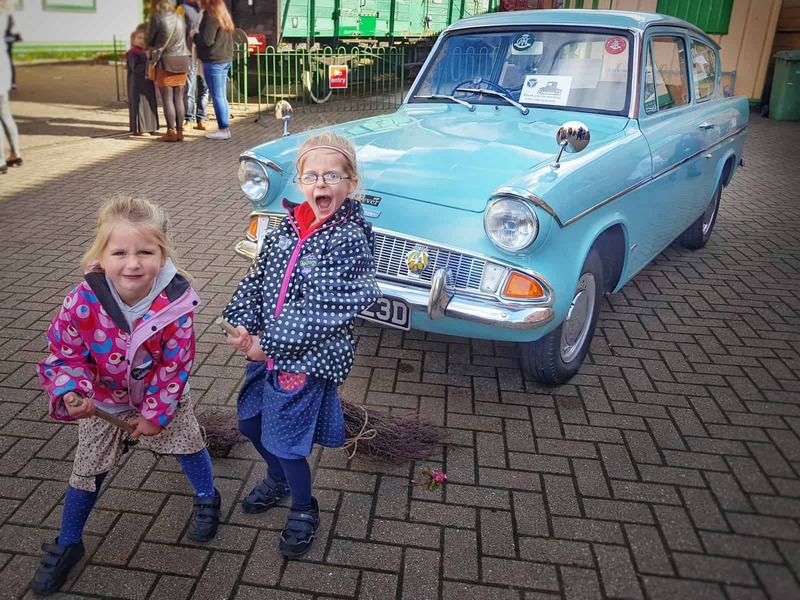 The girls were delighted to see the Harry Potter themed Ford Anglia at Alresford, based on Arthur Weasley’s flying car. But that was just the first of many exciting things going on there. 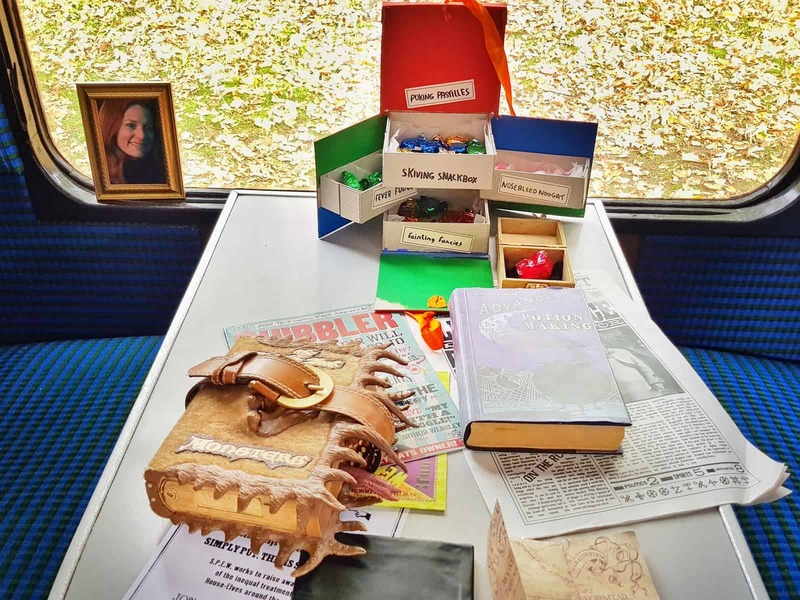 After a quick photo stop, we headed for the Harry Potter railway carriage. 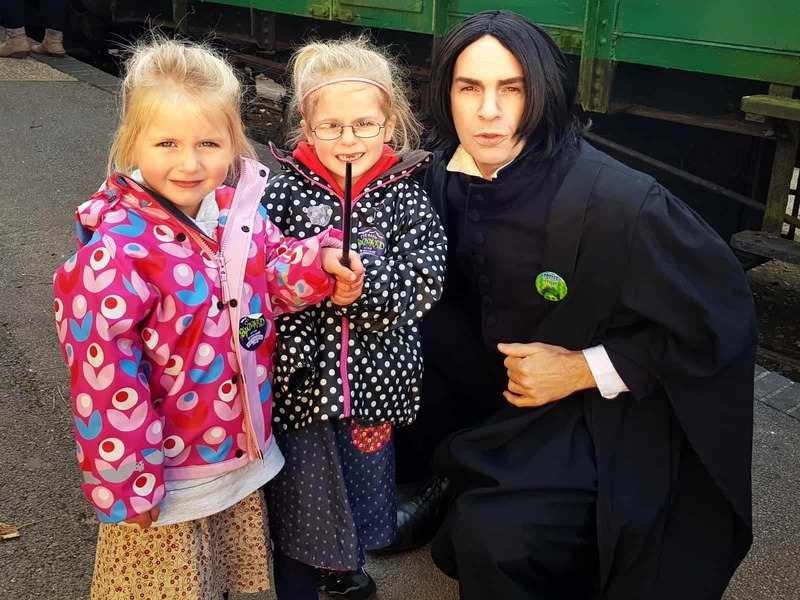 Throughout the Watercress Line during Wizard Weekend, Harry Potter characters are on hand to meet their fans. As we were approaching the carriage, who should be walking away from it but Professor Snape himself. Both girls were delighted to have the opportunity for a photo. 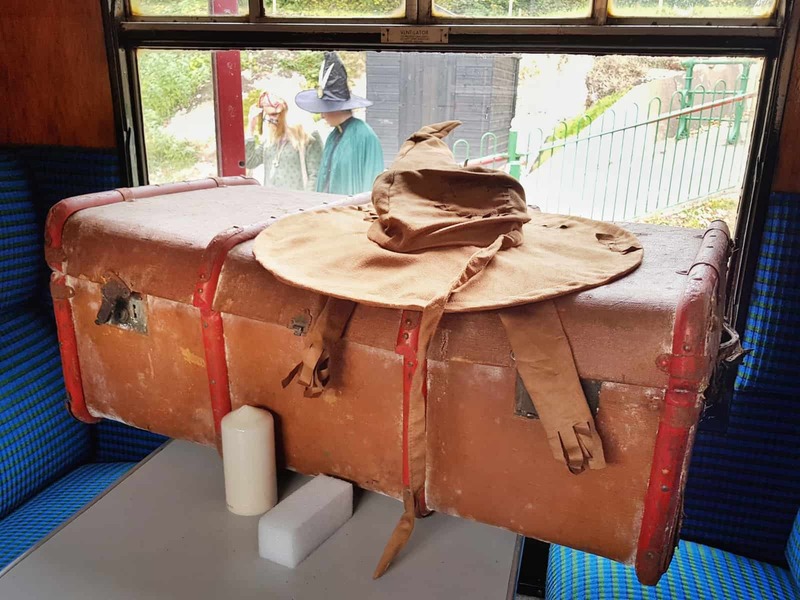 Visitors can walk through two Harry Potter themed carriages, one of which was used in a couple of the films. The atmosphere in them is so magical that my girls came away desperate to watch the first film. This is a real breakthrough for us. They’ve been reading the books but worried that the film would be too scary. 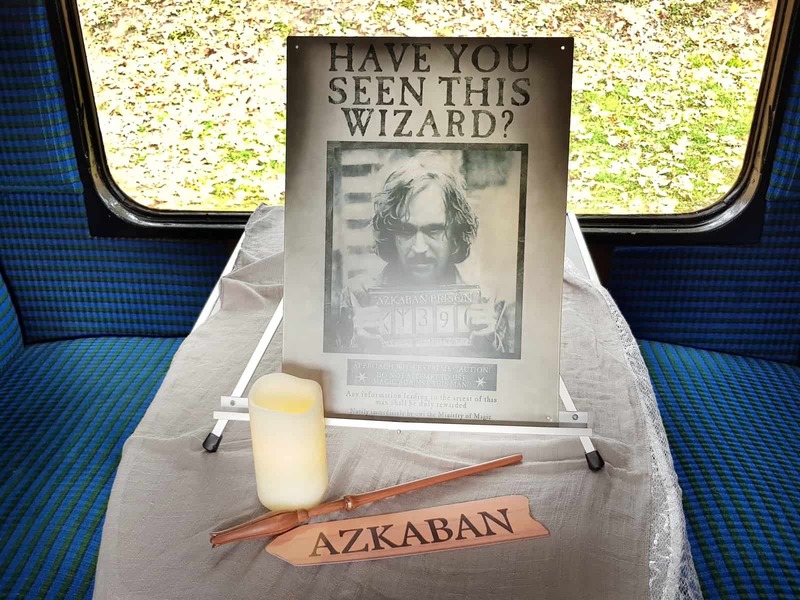 Being immersed in the Wizarding World at the Watercress Line seems to have changed their minds. On disembarking the carriage, there were more favourite characters waiting to meet us. 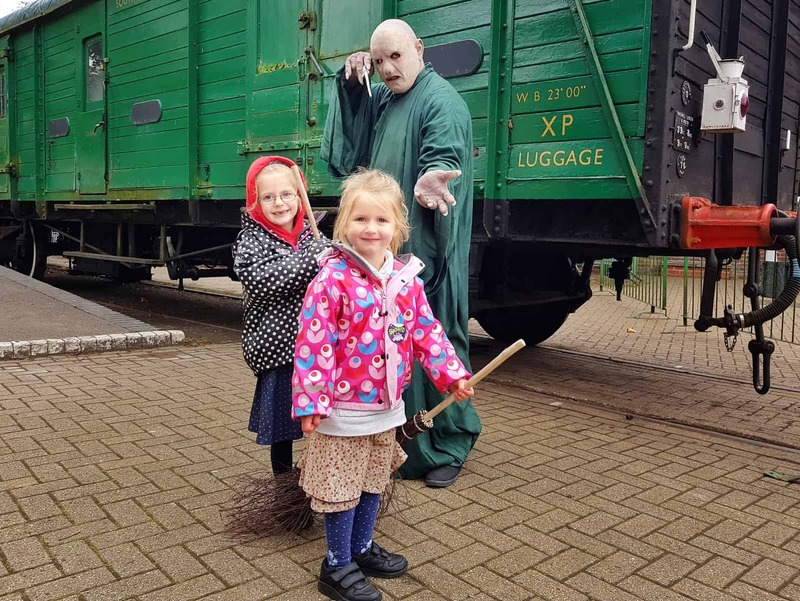 I was surprised when the girls agreed to have their photo taken with Voldemort. He must have been having a good day because he seemed remarkably friendly. 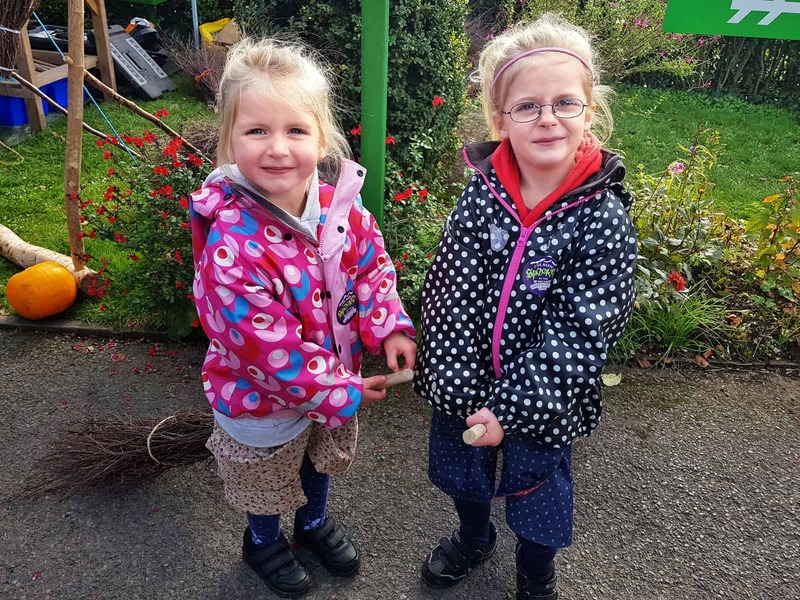 The girls decorated their own wands at one of the craft stalls. This cost just £2, which seemed like a real bargain. Particularly as the cheapest wands at the Warner Bros Studio Tour cost £29. Whilst their wands were drying, we grabbed some lunch at the cafe and took our turn to run into the wall on platform 9 3/4. 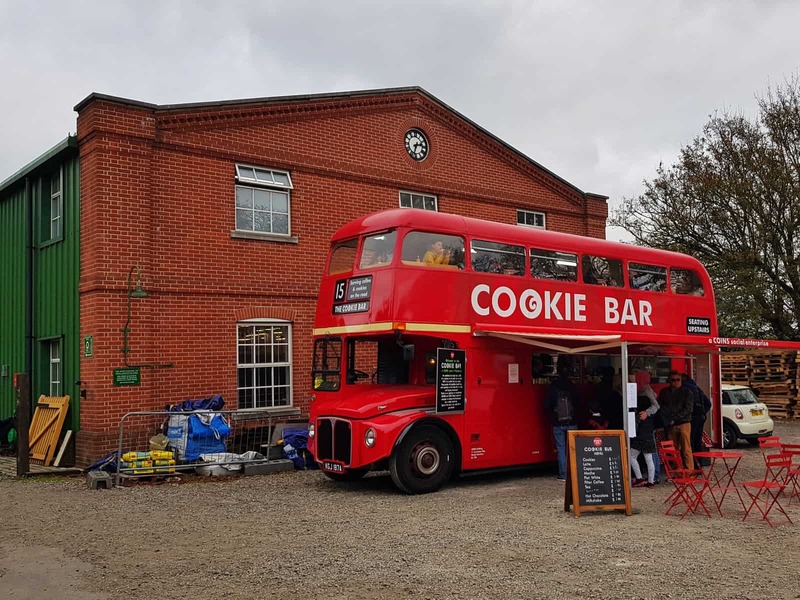 The cafe was very busy but other food options were available at Ropley, including a caravan serving pizza and a double decker cookie bus with hot drinks and snacks. 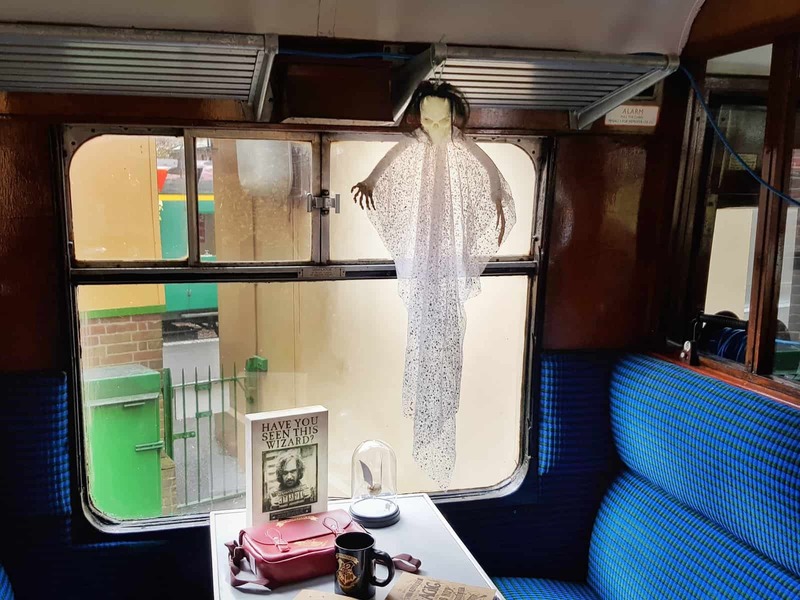 Back at Ropley, the girls and my husband went on a Spooky Tour. Bubbles and I looked after the broomsticks and met them on the King’s Cross Footbridge at the end of the tour. 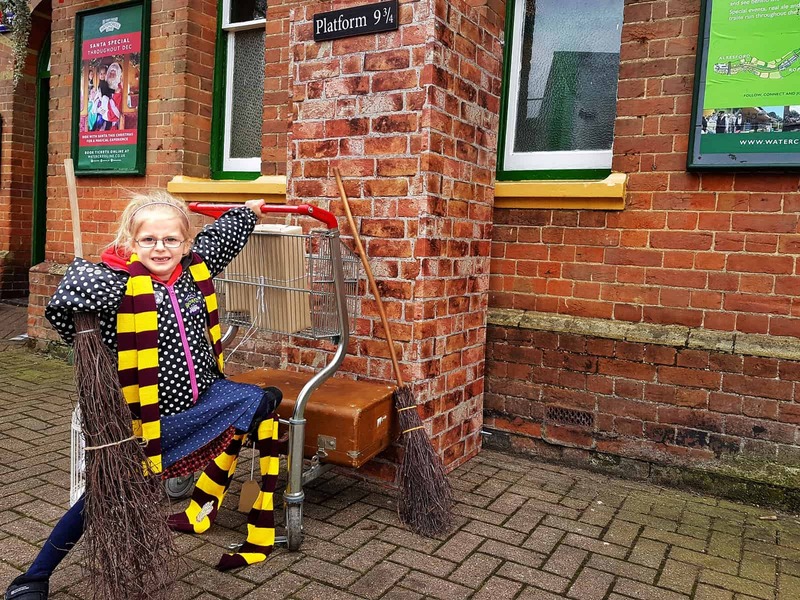 Here, the girls dressed up as Harry Potter and posed with their broomsticks, wands and some wizarding luggage. Of course, Bubbles didn’t want to be left out. 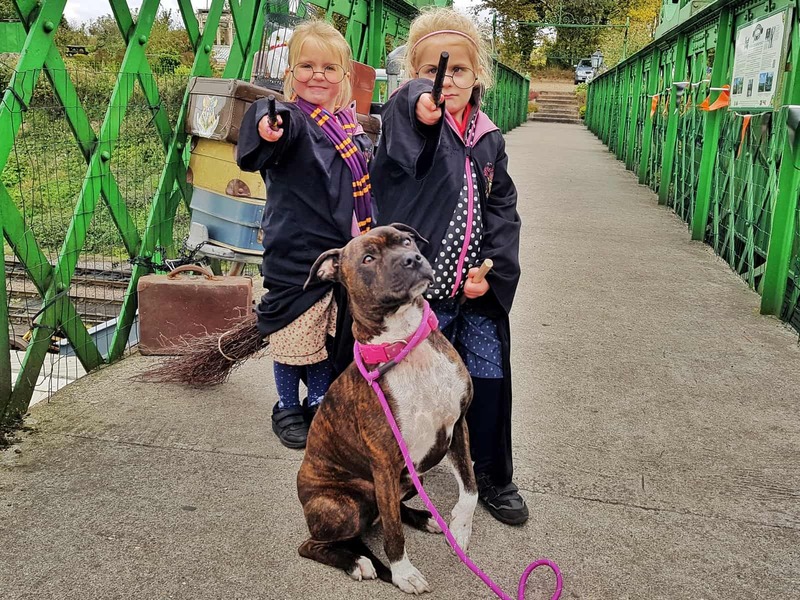 This resulted in a hilarious photo that looks like Libby has conjured up her Patronus and Bubbles doesn’t like the look of it. 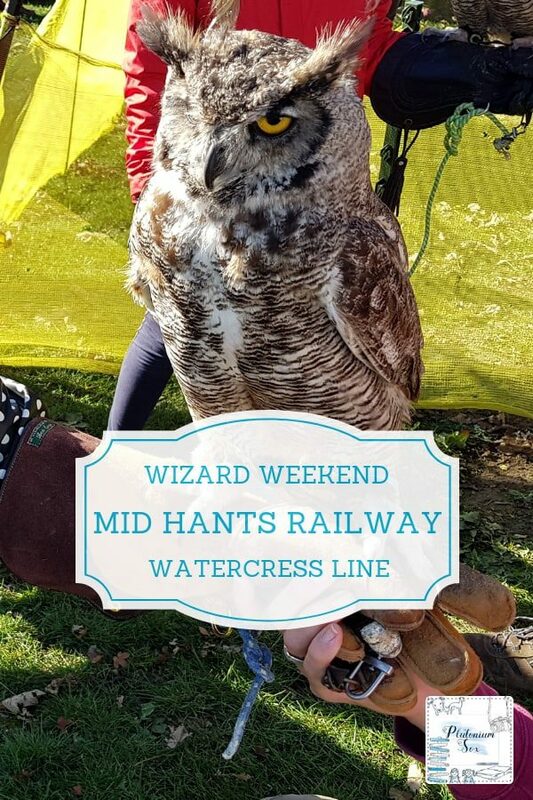 Wizard Weekend continues on Sunday 28th October and full details are available on the Watercress Line website. 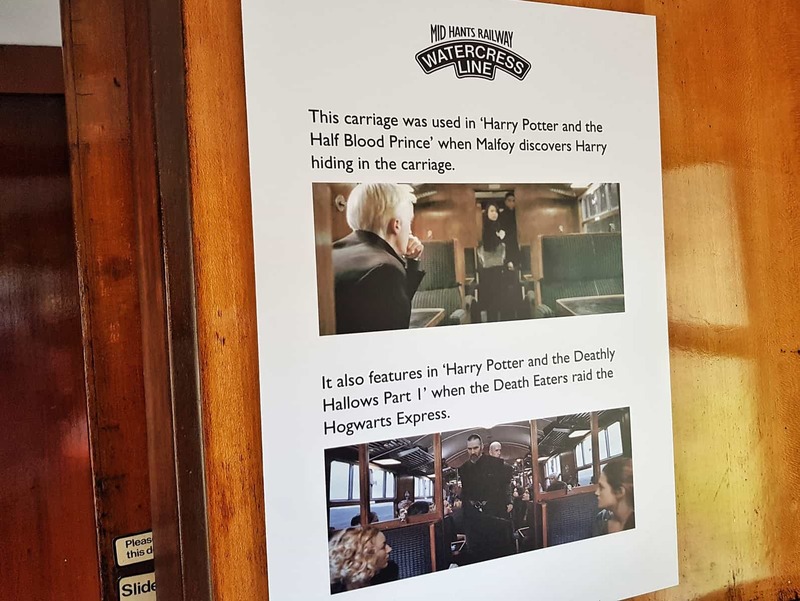 Please note, we were given free entry to the Wizard Weekend on the Mid Hants Railway Watercress Line to allow me to produce this blog post. All views, opinions and shocked looking dogs are my own. Previous Post How do you draw a flavour? Hi Nat,your girls look like little Harry Potters in the making. The wizard weekend looks like a lot of fun for Harry Potter fans. 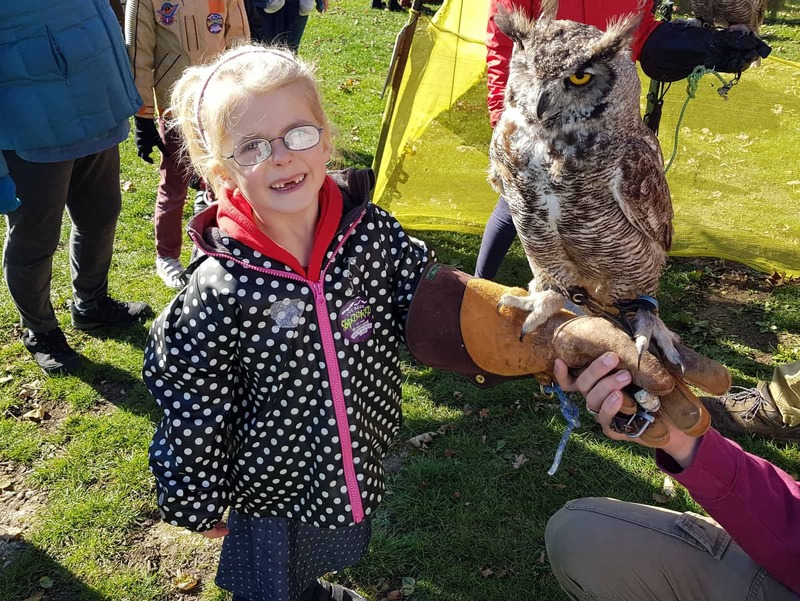 That owl is an amazing looking bird, Libby looks tickled pink to hold it. Oh you definitely should! 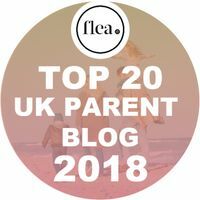 Maybe you should time your visit down this way with their next event, if you do we’re coming too! It was really brilliant, we were all so impressed. And yep the wand thing made me think! This sounds like such a wonderful day out!